The jury team of DandieOnline is glad to present you the DandieStar**TopInfo Award in honour of your really great job – congratulations! It was a great pleasure for us being allowed to visit and evaluate your "Assess Risk"
I am so happy and honored to send you this award for your website because it was a pleasure visiting your wonderful site. 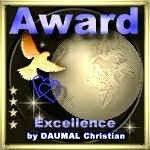 For me this award is a bearer of peace and happiness, because I think that your Web site is the reflection of your soul. Have a nice day, Christian DAUMAL. We have now finally finished our evaluation of your excellent web page, and are honoured to present you with the DWD award. The evaluation: 1 - Navigation - easy and straight forward; 2 - Load time ok; 3 - Design excellent and with consistency - great layout; 4 - Graphics excellent and load quickly; 5 - Content is interesting, informative and presented in an excellent way; 6 - Coding is technically sound. All in all - Congratulation - on a job well done. Sincerely, DWD c/o Bitten Jönsson.